While Gray fights Lyon, Natsu fights the masked Zalty. Both Fairy Tail members beat their respective opponents just in time for Deliora to finish being revived. Gray prepares to encase it in Iced Shell again, but before he can do this Deliora starts to fall to pieces. Back in the village they find that the villagers are still demons. Erza uses Natsu’s help to destroy the moon, but what they destroy instead is a lens of crystalized moon drip that had been affecting the villagers’s memories, revealing that they were originally demons, but they thought they were humans. Back in Magnolia they find their guild destroyed by a rival guild, known as Phantom Lord. 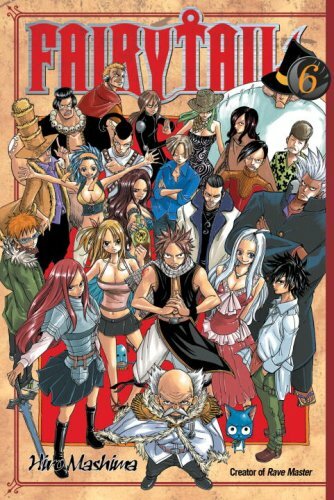 At first Makarov refuses to retaliate, but the attack on three of their members by the Iron Dragonslayer Gajeel forces their hand. While Fairy Tail is attacking Phantom Lord, two of Phantom Lord’s S class wizards kidnap Lucy. I was prepared to ream the reveal that moon drip hadn’t transformed the villagers. My biggest complaint was Lyon’s statement that he and his friends had been bathing in the light for three years. While it does make sense, and is something I should have picked up on my first read through, it still does not entirely make sense. Yuka made several comments in past volumes about moon drip having transformative effects. And to have Lyon suddenly say moon drip didn’t transform the villagers felt like a copout. However, reading it again, Lyon does admit that moon drip has a small effect on the human body. So Yuka’s comments are justified enough that this is not a real plot hole. I normally wouldn’t bring this up, but I figure others might notice the same inconsistency I did initially, so I figured I’d put my answer to the question out there. While the end of the Galuna Island Arc is a bit of a letdown, Deliora’s death doesn’t make much sense when you consider that he was moving immediately after getting out of the ice. Overall it’s a minor point, but one I feel is worth bringing up, because it bothered me in my first read through. During this readthrough, however, I decided it probably had something to do with Deliora being a supernatural being. If chickens can keep moving after having their head chopped off, then I think a demon could do the same. As a whole the Galuna Island Arc isn’t my favorite part of the manga, but I enjoyed it a lot more than I remembered. It hits all the necessary beats for the typical Fairy Tail arc, but it does it in quite a bit less time. So for wondering what reading this series will be like, this is the point at which they can decide if they want to stick with it or not. Volume six gets a few more points for also being the start of the Phantom Lord Arc. This was the arc where I decided I was really going to enjoy Fairy Tail. The stakes were raised, and all the guild joined in, not just the main five. This volume ends at what I think is an almost perfect cliffhanger. We’ve seen what the two guilds can do, and now the stakes have been raised. Overall, a worthy purchase for anyone that loves shonen manga.